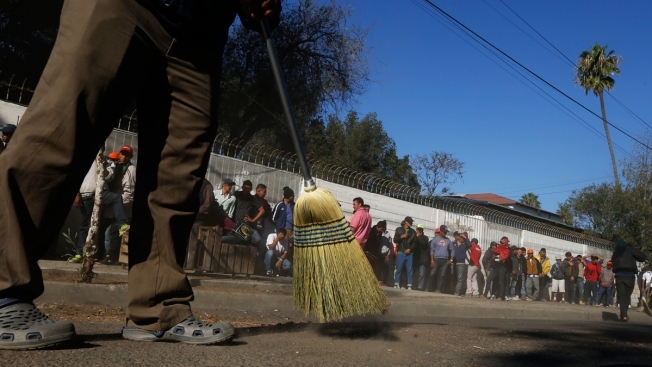 Central American migrants sweep outside the shelter where they are staying in Tijuana, Mexico, Sunday, Nov. 18, 2018. Protesters accused the migrants of being messy, ungrateful and a danger to Tijuana; complained about how the caravan forced its way into Mexico, calling it an "invasion," and voiced worries that their taxes might be spent to care for the group as they wait possibly months to apply for U.S. asylum. Secretary Kirstjen Nielsen to See 'Border Hardening' Efforts in Southern Calif.